Thanks for writing. 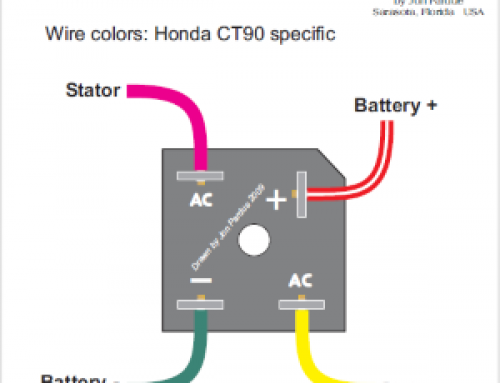 We make rectifiers to fit early Hondas, and will be glad to make one to fit yours. 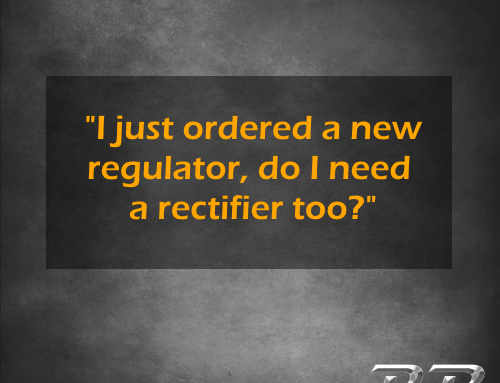 Since there are variances in the early rectifiers, we need your help to get it right. As many wiring diagrams as I have, including an exceptional scan of an original C100-C102-C105 owner’s manual, only the C100 and C102 have a wiring diagram. The C100 has a 2-wire rectifier, and the C102 a full wave rectifier with 3 wires (a 4th connection is the ground bolt). Your original rectifier probably has wires attached with ring terminals. The full wave devices may have a Dark Brown wire and a Yellow wire as AC power inputs, then a Red wire to the battery + connection. 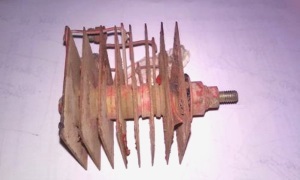 Typically there was no wire to ground, just the bolts holding the rectifier provided the ground connection. 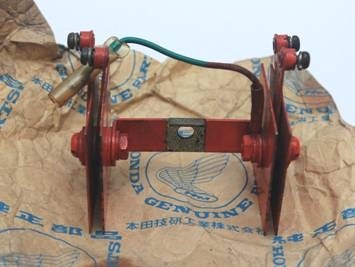 We have a full wave rectifier here from an early 60’s Honda C100 that is about 2” square, and it mounts with a D-shaped bolt (a 10mm wrench fits the nut, which makes it a 6mm bolt). 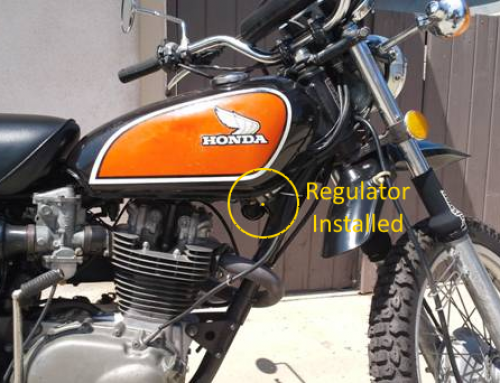 Some of these rectifiers mount on a sort of “L” shaped bracket, held to the bike with two bolts. Our replacement has a new D bolt we mill from stainless steel, nuts and lockwashers to match. Its got 4 wire connections with screws, for ring terminals, which we replace with Posi-Loks. 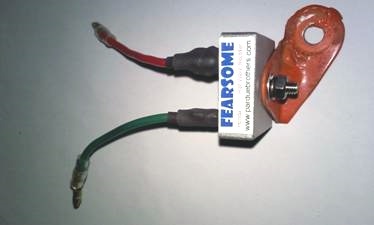 Shown below is the Fearsome Extreme full wave rectifier we make with standard 3.5 mm Honda bullet terminals, as a size reference. Its about a 1-1/4 inch cube, so its smaller than the OEM finned rectifier. Same size bolt hole through the middle. This odd rectifier fits around the C70M airbox, has 4 wire connections, and an extra Green ground wire with female barrel connector. One guy had a 3 wire C102 rectifier like this square one. 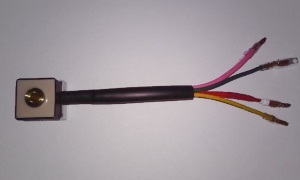 Yellow, Pink, and Red wires, male bullet connectors. Ground is to chassis bolts, and we added a Green wire with a female bullet as well. We also manufacture a half wave rectifier, to replace Selenium devices like this one fitted to the C100. 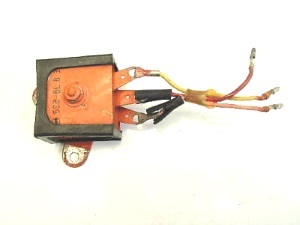 Our 2 wire ½ wave rectifier generally has two male bullet connectors. Here is one fitted to a customer’s original bracket. 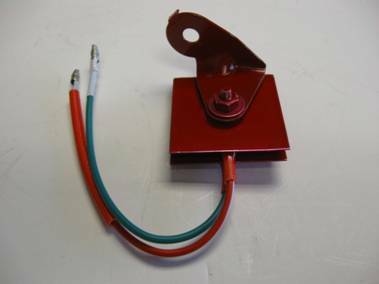 If you have a photo, sketch, website, or can tell us which rectifier you have, we can make it. We do not make a rectifier with screw terminals, however we do supply Posi-Lok connectors for those bikes which are safer and more secure. You cut the ring terminals off to install Posi-Loks. Let us know your thoughts, glad to be of service. If you could benefit from some positive help from Jon Pardue, Please Contact us. This is a fabulous post. You have the most informative content I’ve been able to find about these bikes. Thanks for all the time you spend helping out the electrically challenged.